GEORGE TOWN: A report from the Beta Analytic radiocarbon laboratory in Florida, in the United States, has revealed that the 5,710-year-old skeleton found at the construction site of the Guar Kepah archaeological gallery in Kepala Batas on April 17 was of a human who had had a shellfish diet. Universiti Sains Malaysia (USM) Global Archaeological Research Centre (GARC) director Professor Datuk Dr Mokhtar Saidin said the report released on Tuesday (May 17) also led to the discovery of a 5.49m-high shell midden at the base of the site which was also filled with artifacts such as pottery and stone tools. “(The discovery of the shell midden) was beyond my expectation, I thought we had it all (after the discovery of the human skeleton). Suddenly, we found the bottom part at the base. After a month, there were two reports, one for the dating of the skeleton which confirmed that it is 5,710 years old, from the Neolithic age. “The other report released yesterday on the isotopes revealed its diet. There was a very interesting graph which accurately showed that the people of that time ate a lot of sea shells. As a result of this discovery, we can imagine how complete the Guar Kepah archaeological gallery will be ,” he said during a press conference held here, yesterday. He said the finding of the shell midden also revealed the human burial process in the Neolithic age as well as other related artifacts such as pottery, stone tools and food remnants. “This is the only evidence of a burial under a shell midden in the country. 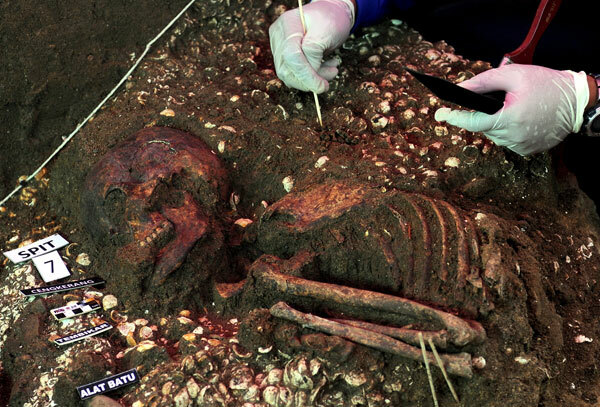 We have (discovered) human skeleton in Lenggong, Perak, but it is 5,000 years old and buried in a cave. “The specialty and uniqueness of the Guar Kepah archaeological gallery in the future is very exciting, the only one in the country to represent the Neolithic’s culture,” he said. Mokhtar said his team was in the midst of studying the shell midden, and a geophysical scan would be done to determine the possibility of there being other skeletons under the midden. “This is not a natural shell midden. This is from remnants of the food they ate which eventually becomes a hill. When one of them dies, they buried him in the midden, it is really unique,” he said. He said the findings would strengthen the country’s historical data on the life of Neolithic society, that they were not just living in the caves of Lenggong, Perak, but also in Guar Kepah by the sea, where they were likely to be fishermen. Meanwhile, Penang Chief Minister Lim Guan Eng who was also present at the press conference said the state government had approved a special allocation of RM50,000 as an incentive for GARC to conduct more detailed studies, field analysis, as well as dating and scientific analysis. He said the state government had also appointed Mokhtar as lead researcher for the scientific archaeological research at the site to be carried out with staff and students from USM.